Description: Phacelia cicutaria var. hispida is an upright annual shrub with flower buds that are held in tight, hairy coils which uncoil as the flowers open one by one. The flowering stems' resemblance of caterpillars lends this plant its common name. The stems are ascending to erect, simple to branched, stiff-hairy and glandular. Leaf: Its foliage is deeply lobed, 2–15 cm long, with spiked segments. 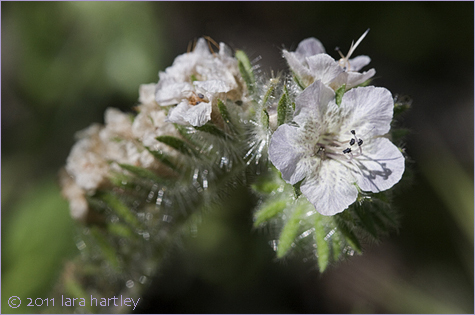 Notes: Phacelia cicutaria var. hispida is drought tolerant, making it ideal for xeriscaping. It can be propagated by seed, germination of which may be stimulated with aqueous extracts of charred wood, or the charred wood itself. Phacelia cicutaria var. hispida is a dicot that is native to California. Phacelias can cause dermatitis. This photo was taken on June 18, 2006.